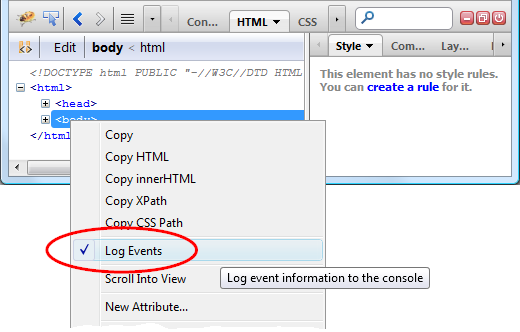 This Firebug feature is called simply Log Events and allows developers to log DOM events into the Console panel. All you need to do is right click on an element in the HTML panel, pick Log Events from the context menu and switch to the Console panel to see the logs in action. If you activate logging e.g. for the body element and move your mouse cursor over the page, you should immediately see mouse related events in the Console panel. This feature can be also used to learn & discover existing events. Let's try to log events for an input element. Inspecting the event object (associated with an event) is also possible. 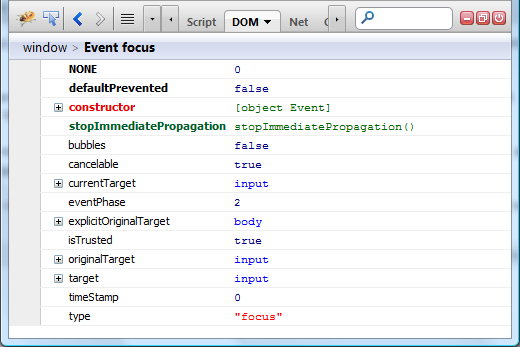 Just click on the green event label and Firebug automatically selects the DOM tab with event details. Event logging for an element can be also activated through Firebug Command Line. There are two related commands. Instead of right clicking on the body element to activate/deactivate the logging (see the first screenshot) you can type and execute following expressions into the command line. All events, just like before, will be logged in the Console panel. If you want to log only specific events and avoid e.g. mousemove events check out the next example. This way, only keyup, keydown and keypress events will be logged into the Console panel for the test input box available above (in the Learn & Discover Events section). You can open Firebug on this page and check it out immediately. See also Firebug wiki for monitorEvents and unmonitorEvents API. If you have any tips how to improve this feature let us know. Honza, you should also mention monitorEvents()/unmonitorEvents(), which give more granular control over event logging. Can you play back these events for automated testing type scenarios? @Sebastian Z.: yep good point. @DDD: Not now, but sounds like a good idea. 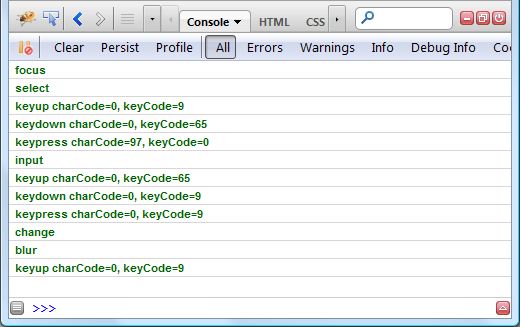 Perhaps new Firebug extension could implement that? How can I enable event logging as soon as the document starts loading? I'm interested in logging all events sent to the "window.document" object right from the start, including any readystatechange and the DOMContentLoaded event. Thanks Jan, I've starred the issue. Firebug is the awesome tool for developer and code hacker because mostly we are in trouble while adding code in source file and sometime code doesn't properly work then firebug will help you out.